Can Lyft Line eventually challenge public transportation? Back in October 2014, I talked about how Line was a great way to cut your Lyft fares by half. Not only was the carpooling service markedly cheaper than a regular Lyft, but the first 5-6 times I used the Line service, I was the only one in the car. Obviously, my solo trips at 50% the normal fare was due to the service being new so there weren’t enough users in the system. Fast forward seven months later and I’m still using Lyft Line to get around. Specifically getting to and from work when I am back in San Francisco. And it’s become much more popular. I am no longer the only passenger in the car. That’s okay because if you’re not in a rush to get somewhere, it’s a great option to get where you need to go and save some cash. When I did share a ride, the extra five minutes to drop off the other passenger wasn’t nearly as inconvenient as I thought it could be. Obviously the Line algorithm is the key. If the difference between regular Lyft and Lyft Line is a 5-6 minute detour on average, and the cost of the fare is 50% off — the value is there. And the more they can cut the detour time down, the better the value. The great thing is that Lyft Line can only improve. The service isn’t even a year old (it was announced back in August 2014), so there isn’t a critical mass of users on the service just yet. Pair improving the service’s efficiency and at some point, Lyft Line may be a feasible competitor with public transport. Lyft may not ever get their prices down to the cost of a MUNI ride ($2.25) but there are a lot of obvious advantages to using Lyft over public transport if the cost justifies the value. Lyft picks you up wherever you are and drives you directly to your destination’s front door, and that convenience may be worth the extra $2.75. My Lyft Line fare was consistently $5 from the Tenderloin to Fremont at Mission Street in downtown San Francisco. 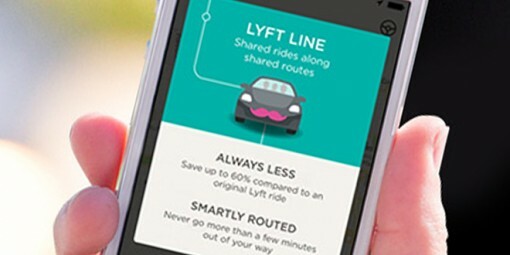 With Lyft Line there is no “transit to transit” time; there’s no walking to a bus station, MUNI station or F Market. And there’s no walking from the designated stop to your final destination. I don’t have a problem with riding public transit, but I know some people have issues dealing with crowds. With a Lyft Line, you have to deal with a driver and another passenger. If Lyft can continually bring costs down on it’s Lyft Line product, it has the potential to eventually challenge public transportation. Get a Lyft discount of $30 $20. Enter discount code STUART12 for a free ride!